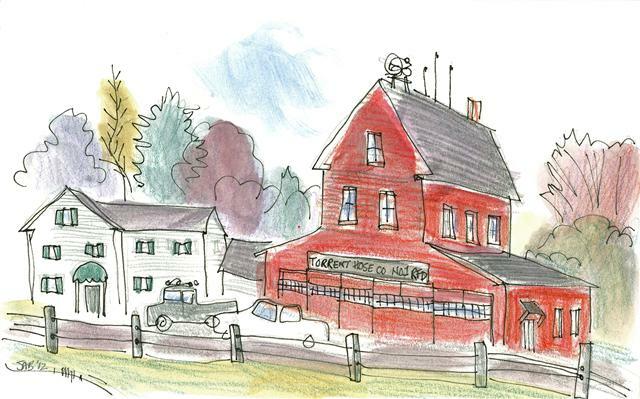 Litchfield is a small town along the Merrimack River, nestled between Manchester and Nashua. We saw lots of rich brown soil, ready for this year’s crops to be planted. The land next to rivers is always very fertile, and it was good to see it used for its best purposes. Meaning, no housing there, just farmers’ fields. 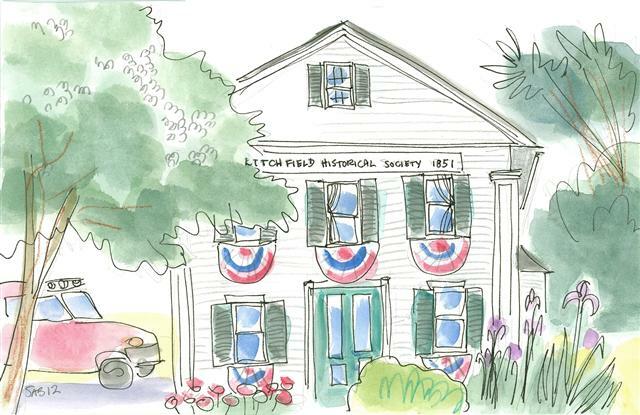 The white wooden clapboard building states that it is the home of the Litchfield Historical Society. The red, white, and blue bunting was up in time for Memorial Day, at the end of May, and will likely stay there until Independence Day, July 4. I don’t know what the original use of the building was. The fire station is next door. One of their vehicles is parked in the shade. 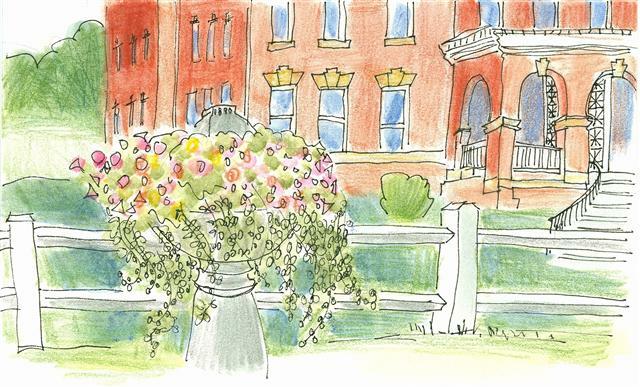 I sat in the grass to draw this, and that perspective explains the very tall purple irises in bloom. Historical Societies are a wonderful New England thing. They range in size and scope from one-room adjuncts to other buildings, run by very dedicated volunteers and open one day a week or perhaps just by appointment, to large activities with professional staff such as the one located in the Amoskeag Mills complex in Manchester. The thing that’s common to all is a love of their locality and a deep appreciation of its rich history. You can find links to over 40 such organizations on this page at DirectoryNH.com. And there are surely others that haven’t yet gotten quite up to speed with the Information Age, but you can find them if you look hard enough once you get to town. We arrived in Londonderry at midday, and as I have mentioned before, I just don’t draw on an empty stomach. So we had a very nice lunch at a corner restaurant, The Coach Stop. We ate on a terrace, overlooking the front lawn. On this lawn sat a buggy. It was in lovely condition, actually looked new. 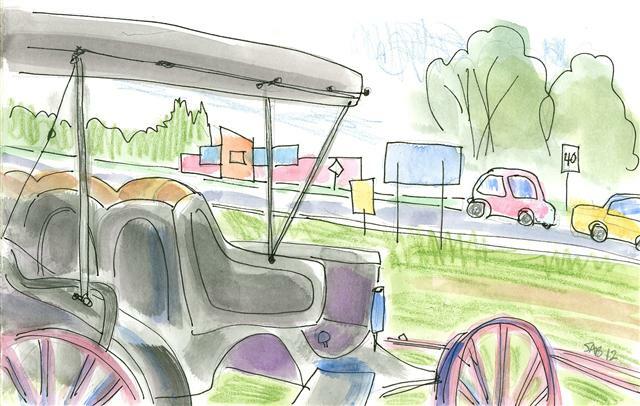 The old vehicle seemed to gaze out towards the busy highway crossroads. A friend once remarked to me that there is nothing I won’t draw. I replied that there is little that I won’t consider drawing. 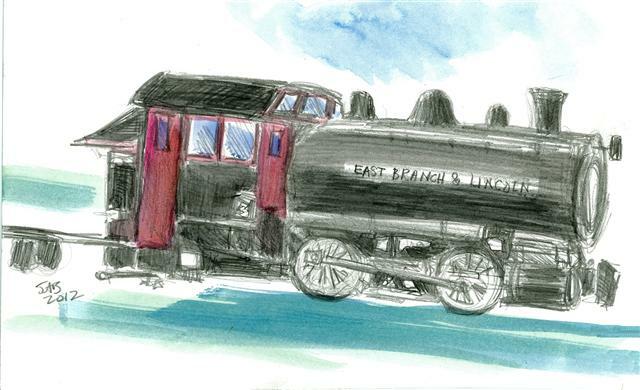 And I drew this locomotive engine at an incredible pace because the black flies were swarming around my face. I wasn’t prepared for the onslaught of the pesky flies that aim for your eyes, since our region 2 hours south was already pretty much through with them for the year. After a few minutes I started to speed up the drawing process even more by just drawing where the train was NOT. In other words, I penciled in the shapes where I could see light through the complex undercarriage of the train. And I finished it at home from my notations. Artists often focus on negative spaces for design anyway, so it worked well. It is all pencil with watercolor for the red, blue, and green shapes. And the vehicle is a lumber train engine in Lincoln in the White Mountains area. 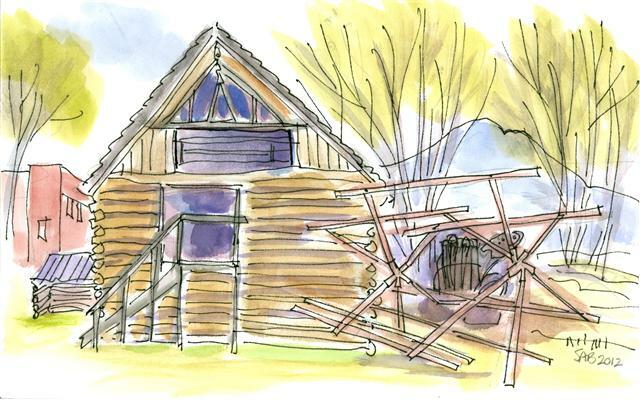 It is no longer used, and is now perched near the entrance to the Loon Mountain Ski Resort. The railroad opened up the White Mountains to logging, as the rivers weren’t suitable for floating the logs down to the mills as was done elsewhere. Logging practices of the day were horrendous, leading to the creation of the White Mountain National Forest and the attendant restrictions on the industry. The sign said that three trains a day went through town loaded with felled trees. And there was a photo of the engine pulling railroad cars piled with pre-built lumber towns into place for the summer logging season. The lumber industry in this area is pretty much over. Tourists are the money makers now. Plymouth is a small city at the southern edge of the White Mountains. 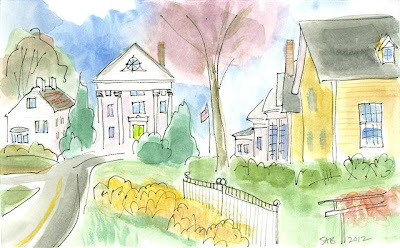 My sister Aimée was born here while our father was a graduate student at Plymouth State University. When we lived here it was called Plymouth State Teacher’s College. He was getting a Master’s degree in preparation for becoming a science teacher. In one class, he was learning to give IQ tests. I think I was the only person in the family who agreed to take it. I was five years old, and I remember the pretty red and white blocks I had to rearrange in a certain time. Plymouth has a shaded sort of oval shaped common or town park. I found this bronze statue there and liked it. It represents a Boy Scout and was sculpted in 1932 by G. H. Borst. The boulder is from the nearby Franconia Notch and the natural pothole basin, at the foot of the boulder, is from the Baker River. I love the details on sculpture, in this case the boy has patches on his sleeve from a local troop, Troop 56. The university buildings are up on the hill behind the white post office. Here is my husband resting on a bench at the Audubon Center in Auburn, NH. The wooden boxes on posts are most likely for nesting bluebirds. I think they have at least 85 of them. The building is named the Broad Barn, for the donors named Mr. and Mrs. Broad. The orange sign says bat box. The center wasn’t yet open for spring and the ground was all soggy, so we didn’t walk around. The sign on the red building says “Torrent Hose Co. No 1 RFD”. It is the fire station in Raymond, NH. Clearly it is an old house, repurposed and expanded horizontally and perhaps raised up one story as well. I was sitting on a bench in the town green to draw this. It is good to have highways to bypass the little towns, in this case Route 101. But then you never see the small towns and have no sense of where you really are. This is one of the many reasons that I am enjoying my Draw-NH project. The only cure for wanderlust is wandering. I don’t post my drawings exactly when I draw them. I put them in a box to accumulate until I see at least two subjects that look like they want to tell a story. I can tell from the orange colors of the leaves that I drew this last autumn. 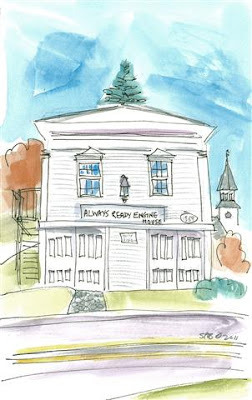 The square boxy white building is the former fire station in Hollis, NH, now the home of the local Historical Society. The letters on the sign spell out the charming name of the “Always Ready Engine House”. It was home of a horse drawn carriage and hose. The tower in the background belongs to the town offices. The little tree appears to be atop the fire station roof, but it is merely centered behind it. I could have moved it, or left it out, but I chose to keep it there like a topknot. Drawing makes you feel powerful. 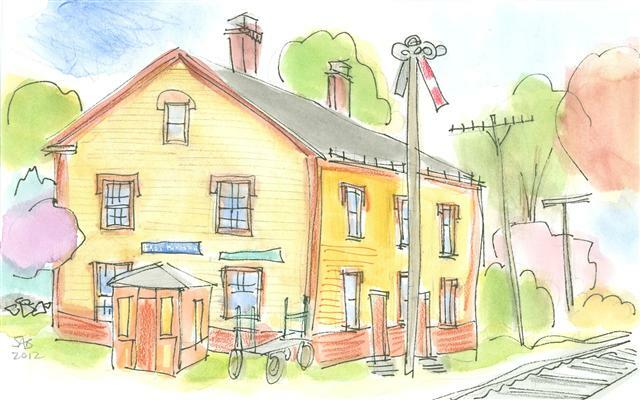 And here we have the railroad station in East Kingston, NH. Yellow and brown are the colors of the Boston and Maine Railroad, I’m told. Commonly referred to as the B&M. I think it is possible that a few trains still use these tracks. 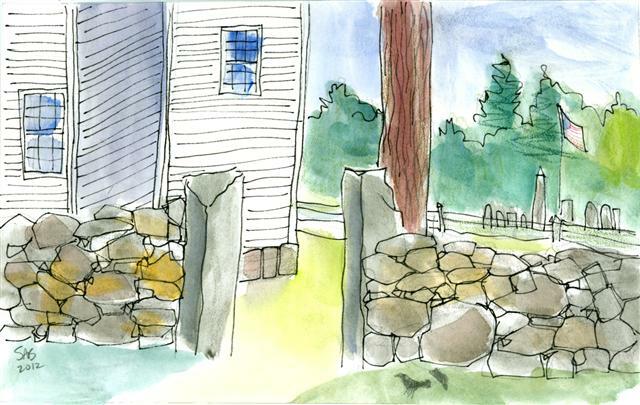 I do have to be careful when counting toward my goal of drawing all 234 towns in the state. 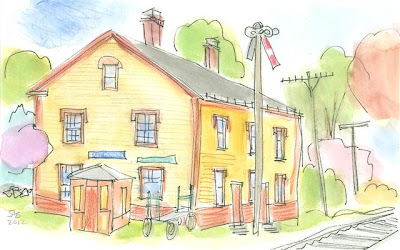 East Kingston is indeed a separate town, though many places whose names feature compass points are just informally designated local areas of the actual town. 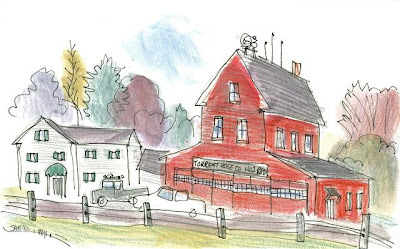 Acton, Massachusetts, where I lived during most of my high school and college years, is the only place I’ve ever encountered that has a locally recognized (though unofficial) North, East, South, West, and Center. And another yellow painted wooden building. New England is all about clapboard construction from local timber. This is called the Ladd-Gilman house in Exeter, NH. It is the side view, from a viewpoint on a street way below the house. There is in fact a cannon on the green grass pointing out towards the passersby. It was hard to draw from a point of perspective, and hard to draw a weapon aimed at me. So sorry to those who are missing the cannon and saying “where is it?”. 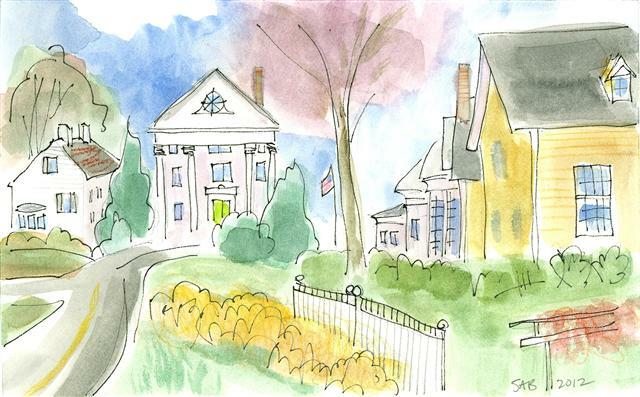 Exeter, it seems to me, has a larger number of yellow houses than the typical New Hampshire town. Some day I would like to understand why. Right now, I just enjoy the cheery phenomenon. This is the steeple of the Pilgrim United Church of Christ in the town of Brentwood, NH. I liked the use of red paint instead of the standard green, and of course, I was taken by the gold colored fish weather vane. The churches of New Hampshire almost always seem to have a weather vane on the top rather than a cross. It is important to know which way the wind is blowing. An historical marker to the side of this church told of a peace rally there in 1812. Two thousand people gathered to hear Daniel Webster speak against Americans entering into the War of 1812 against the British. Many historians regard the War of 1812 as the Revolutionary War, part II. We have been friends with the British ever since we settled that conflict. We call each other cousins. When we lived there for three years as a family, the daily struggle with language and cultural differences nearly did us in. At times. 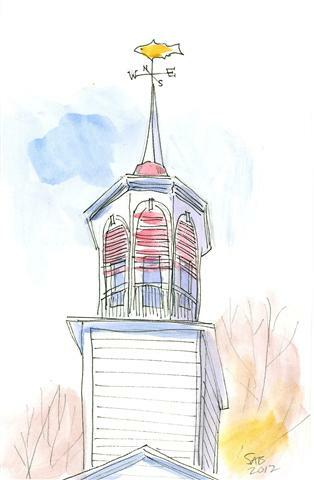 I sat on the grass directly underneath this tall steeple of the Parkhill Meeting House in Westmoreland, NH. The current appearance of the meeting house dates from 1824. And it was moved to this spot from a nearby location as the population shifted. I am so impressed with the skill to move buildings. 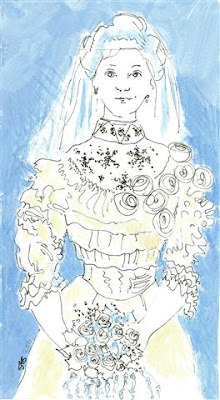 I included this drawing and the next in honor of June brides. 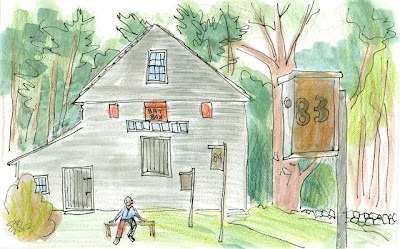 Walpole is an attractive village in the western part of the state along the Vermont border. I just knew that I would have some trouble deciding what to draw. So I went into the town’s Old Academy Historical Society. And I happily wandered through the exhibits. I was struck by a beautiful wedding gown from the 1870’s. The dress fabric was champagne colored satin, with multitudes of chiffon roses. The bodice was a delicate sheer lace with hand appliqued flower clusters. I liked it so much I decided to draw it on the spot. And then I got the idea to envision the wedding bouquet. And then I extended the paper to draw the bride’s face, hair and veil, again through my imagination. I used to work for an old large country estate in Maryland. For four and a half years, I went to a wedding a week. My job was to ensure that all was going smoothly. Or if not, to assist where needed. It was a real behind-the-scenes job. I liked my job as I ate well, heard wonderful music, and witnessed much happiness and joy. I drew the Barrington Community Playground in Barrington, NH while sitting in the car. There were several parents there supervising and having a Saturday afternoon chat. But I chose to just draw the children. 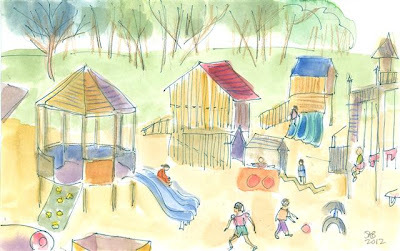 It was quite a fun adventure style playground that the kids were enjoying a lot. New Hampshire and British Columbia! 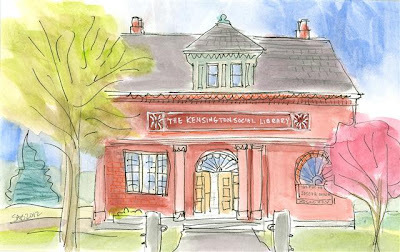 While I was outside drawing this beautiful brick library in Kensington NH, my husband was inside getting a deluxe tour from the librarian, who clearly loved the building and the history it represented. 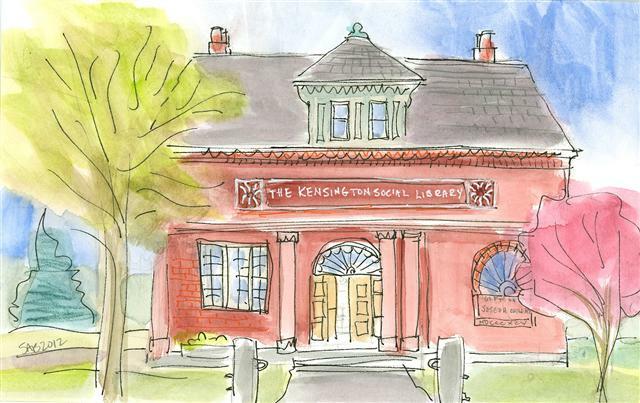 The sign above the door says in white letters The Kensington Social Library. The building was a gift of Joseph C. Hilliard in 1895. It has a modern wing out back (nicely concealed so as not to detract from the original architecture), and it is next door to the elementary school. That must be handy for the students. I just love the conflicting architectural devices of this era, e.g. the symmetrical and the asymmetrical windows and columns. The term ‘social library’ is a holdover from the early 1800’s when libraries in New Hampshire were private book collections. If you joined as a member and paid a fee, you were allowed to borrow. Ironically, libraries are now evolving into more social centers with meeting rooms, and clubs such as knitting. My sister and her husband have recently posted photos of themselves at their library in Wisconsin...one while enjoying a Death by Chocolate cooking competition and another at a costume party. 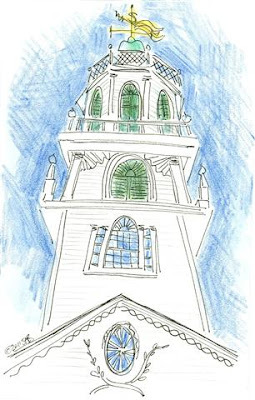 My drawings and watercolor paintings always indicate the weather and the season as well as the architecture. The trees in spring are yellow-green and pink. 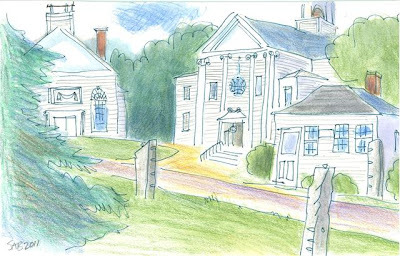 When I am driving around in my project of drawing every town in New Hampshire, two thoughts are usually floating around in my head: “Oh, I have never seen that before” and “Oh, that building really looks like the one in such and such a place”. 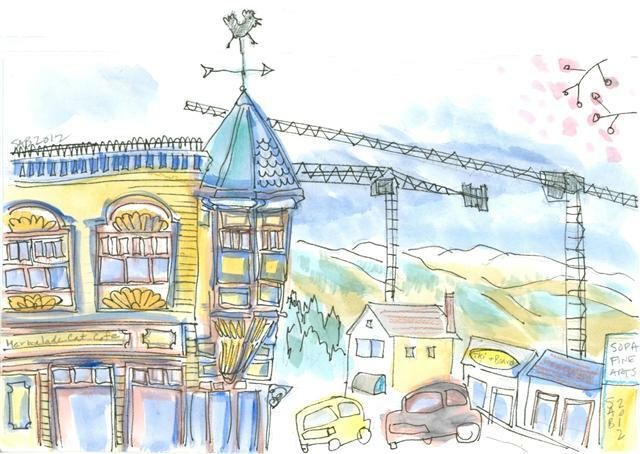 If the towns are close together, I sometimes feel I am following around a local architect/builder. And I know that pattern books and mail order trimmings were readily available, so that could explain many of the similarities. This is Bedford Center, NH. The town hall is in the center, which includes the Narragansett Grange No. 16. The yellow building is a private home, and just to the left of that are small views of the end of the town library. And the white building on the far left is a home. Granges were established a in the mid 1800’s as a social movement. This was an era when half the population left to move to better farmland in the midwest states of the US. Those who stayed behind suffered from the lack of man power to keep the land in agriculture. Most fields quickly reverted to woodland, and New Hampshire slid into a severe economic decline. For decades. The yellow shrub is called forsythia, which cheerfully blooms early. It blooms before its leaves pop out so the color effect is dramatic. Since this has been a cool spring, they are still in bloom a month later. The odd brown shape to the far right is a vine on an arbor. If you should go to Bedford Center, you will not see this exact view. I drew it as I was walking up the road, adding new details and sightlines as I went around a corner. That is the fun of drawing on location. These are the main cross roads in Gilmanton, NH. The tallest building in the center is the home of the town offices. On the left stands the Gilmanton Community Church, and on the right is a small scale public library. I didn’t check to see how many copies of the novel Peyton Place (Grace Metalious, 1956) may be inside. It was always said that she based the plot and characters in her scandalous novel on this town, where she was living when she penned it. 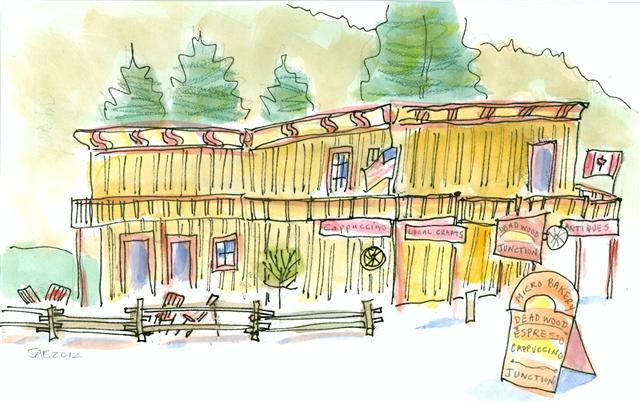 The town office, grand in scale but built of wooden clapboards, has an unusual window. It is circular and resembles a globe in an atlas. Tricky to draw. Notice the granite pillars along the roadway. There were too many to count, but they seemed such a part of the place that I had to fit in three. They were once part of a fence. I wouldn’t want to meet one with a car fender. New Hampshire is the Granite State. 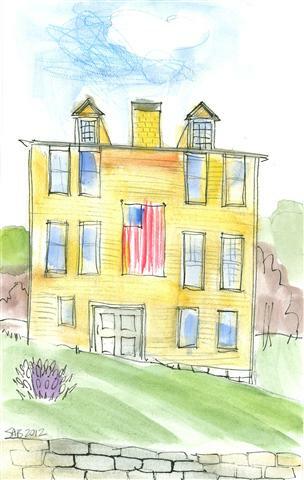 My historical advisor tells me that the ‘traditional’ white New England buildings date only to the 1930’s. A conference was held and sponsored by Yankee Magazine. The attendees discussed how to get more tourists to come to New England, stay longer, and spend more money. It was agreed that painting all the buildings white would have a unifying effect and successfully convey quaintness. The paint companies were most happy to assist and encourage this thought. (Up to this point, the buildings were left unpainted or painted with whatever was the least expensive color available.) No harmony at all in other words. Litchfield, Connecticut was selected as a trial town. White paint was slapped on all the buildings in the town center. Then the owners were required to attach black or dark green shutters. Voilà, instant charm. (The plague of shutters with no function continues to this day. Don’t get me started on shutters that don’t shut.) It worked. 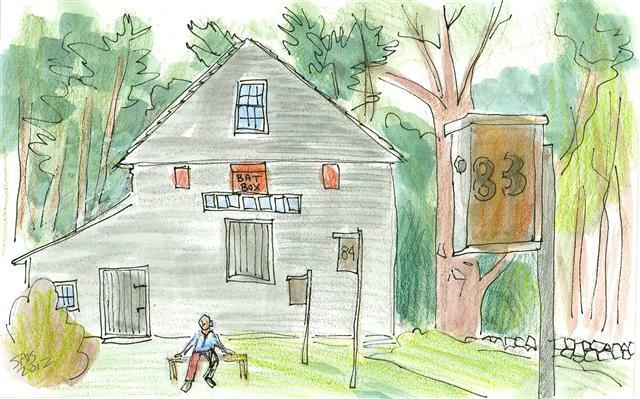 Tourism picked up, and paint brushes and buckets emerged all over the six New England states: Maine, New Hampshire, Vermont, Massachusetts, Connecticut and Rhode Island. Fremont is a small town in the southeast part of New Hampshire. I decided to draw their town pound viewed from the inside. In earlier days, wandering livestock would be corralled into this enclosed space until the owner could come claim them. It is made of small granite boulders and upright granite posts. It is kept as a relic, and somebody must be restacking the stones from time to time because these kinds of walls do tumble down. It is not easy to draw rocks. I try to draw the idea of rocks, if you see what I mean. 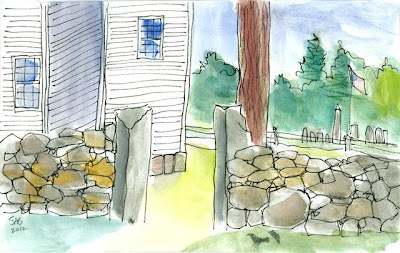 In behind is the Poplin Meeting House, 1800, in white clapboard, and a graveyard across the road. My paternal grandfather and his parents and brothers came south from Quebec, Canada to work in the granite quarries of Concord, NH. I think they may have been stonemasons in Quebec as well. Fremont has an historical marker about the town’s Mast Tree Riot in 1734. This was a little altercation between local tree owners and the English Crown. It seems the Crown reserved the tallest and straightest pine trees as masts for the king’s ships. And some folks objected. 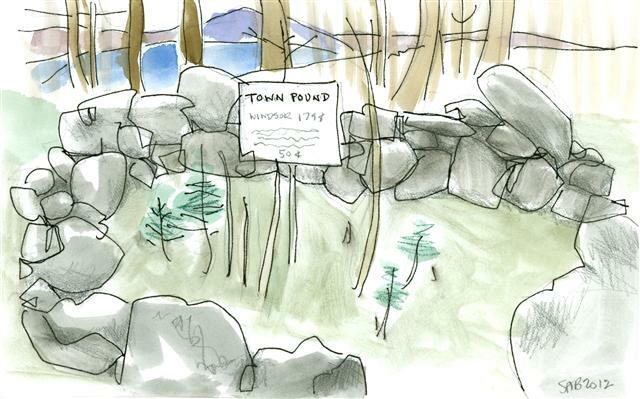 And here we have another stone town pound in the tiny town of Windsor, just west of Hillsborough. It has a population of about 200 in about 8 square miles It was known as Campbell’s Gore originally. A gore is a wedge shaped piece of land, sort of a leftover. The sign in the center notes that the fee for claiming an impounded animal was 50 cents per day—quite a large sum by the standards of the time. Little volunteer evergreens are sprouting in the center. I like how I could see through the woods to a lake and a mountain. 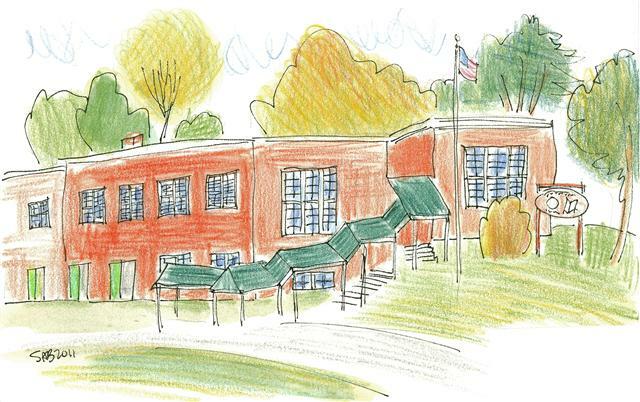 I decided to gather a few of my drawings of schools, in honor of the winding down of the school year. Schools in North American close for the summer, in early to mid June. The summer camp industry has grown to fill in the gap of time in the summer. I am a volunteer at our local elementary school, where I talk about art history once a month. To make this drawing, I peered in through very dusty windows. It is the Bow Center Schoolhouse, 1894, in Bow NH, and is no longer in use. Of note, the black slate writing board. The lettering above this chalkboard is called the Palmer Penmanship script. I think it is still taught in North America. It is a distinctive style that does not resemble that of England, Europe, or anywhere. Most people evolve a simpler form as soon as they leave elementary school, age 10. Most of my letters look like printing, although some are still loopy. 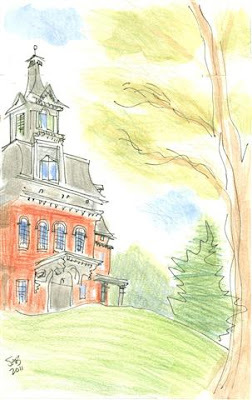 To continue with the school theme, here is the former high school in Ashland, NH. It sits high on a hill and is a Victorian era gem. 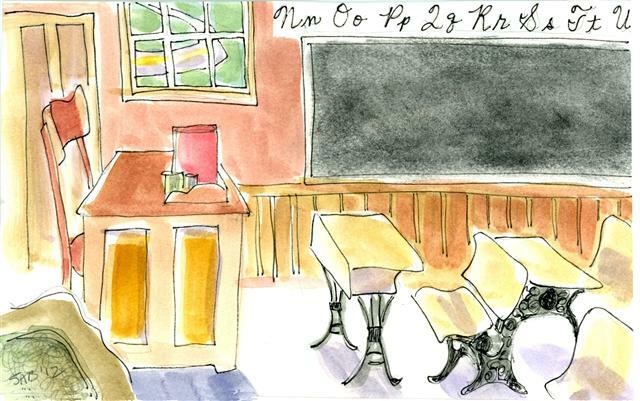 My father had his first teaching job here, in the late 1940’s and early 1950’s. He taught all the mathematics and science classes for ages 14–17. As a first teaching job, it sounds very challenging. I was about 4 or 5 years old. My memories include my pet hamster, and the five and dime store down the street. It was not a Woolworth chain store, but similar in concept. The counters and shelves were so low I could see all the assortments of lipsticks, frilly handkerchiefs, and fake pearl clip-on earrings. The next year we moved to Massachusetts, where the starting salary for teachers was greater. 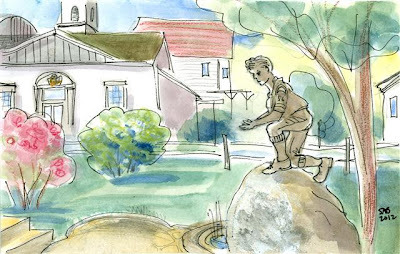 We lived in Westford, moving into three different houses, until I was fourteen. Brookline, NH borders the state of Massachusetts in the south. I seem to be drawn like a moth to yellow buildings. This is the large square building of the town offices. 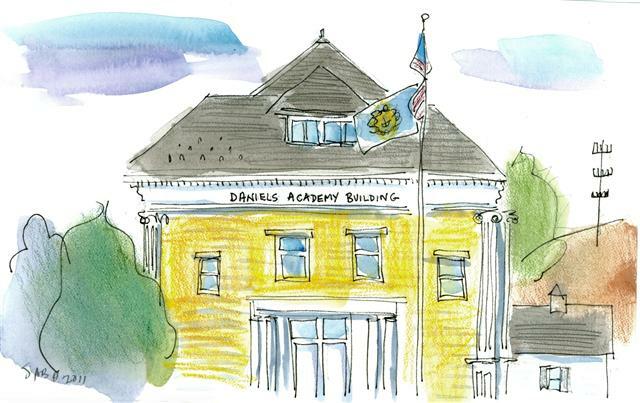 It is the former home of the Daniels Academy, founded in 1905 for girls and boys. It looks dignified and solid, and well worth repurposing. New Ipswich is a small town along the Massachusetts border. I bought a coffee and a cookie at a small store, for a break. The coffee shop was next door to this elementary school, the New Ipswich Center School. I really liked that green awning that shelters the students from the weather. My father-in-law was not a very hard working student in high school. He was sent off to the New Hampton School in New Hampton, NH for a year after he graduated, for the purpose of bringing up his grades so that he would be accepted to a university. This was accomplished through enforced study halls. And the lack of female students in his classes helped too, I’m very sure. My father-in-law had a facetiously pompous way of speech. Right now I can hear his voice, from the hereafter, urging me to use the word ‘pulchritude’. Which is a very awkward sounding word meaning beauty of females. Anyway, this is Lane Hall on the campus of the New Hampton School, built in 1919. The planter has a date of 1890 on it. This building has what I call cowboy style architecture. It is the Deadwood Junction in Greenwood, British Columbia, Canada. It has wonderful coffee, pastries, and rooms of arts and crafts. And very friendly owners and staff. I read that Greenwood, Canada’s smallest city (a form of government distinct from that of a town), with about 700 people as it says on the sign, just won the top award at Berkeley Springs, West Virginia—the international competition for the best tasting municipal tap water in the world. This is one reason why their coffee is so good, no doubt. We happen to pass through Greenwood when we drive from Spokane, Washington to Kelowna, British Columbia, Canada to visit our family, including our three grandchildren. We got a recommendation from some people walking down the street in Grand Forks, a mere 40 miles or so east. Even though it is spring time, the climate is very dry here as indicated by the yellow hills in the background. Sometimes we do a bit of exploring on our own while we are visiting family in British Columbia. One sunny day we decided to explore the Father Pandosy Mission. In 1859 a group of Oblate priests made a home in the Kelowna valley, the first group of white settlers. My quick online research tells me that Father Pandosy was born in Marseilles. France. And that the word ‘oblate’ means sacrifice. I believe the fathers started farming and planting orchards. And now there is an upscale shopping district in Kelowna called Pandosy. The building on the left is not old at all. Just a funky, contemporary nod to the old, which houses the Marmalade Cat Café. I can’t resist yellow buildings. And yellow, blue and rust colored buildings really hold my attention. I can’t explain this and that doesn’t bother me. There is still snow on the high hills. We sat in a lovely coffee shop while I drew this. And knowing that the new building will block the view. 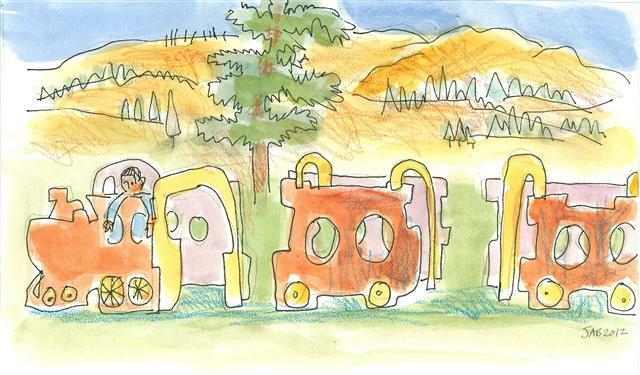 And one more last one, including our grandson playing in a toy train. It is a stationary train. Only imagination makes it move. We go to the park often when we visit. It’s a grandparent thing. The climate here in eastern British Columbia, the Okanagan, is semi-arid. It is the northern end of the Sonoma desert which starts in Mexico. So the ground is dry with desert type plants and animals. But it has lots of lakes and beaches too. We get ourselves there as often as we can. Which is often.